I'm really excited about the work I've been able to do recently on NEW 2014 planner products! To celebrate, I am discounting both versions of the 2013 planner in my shop. 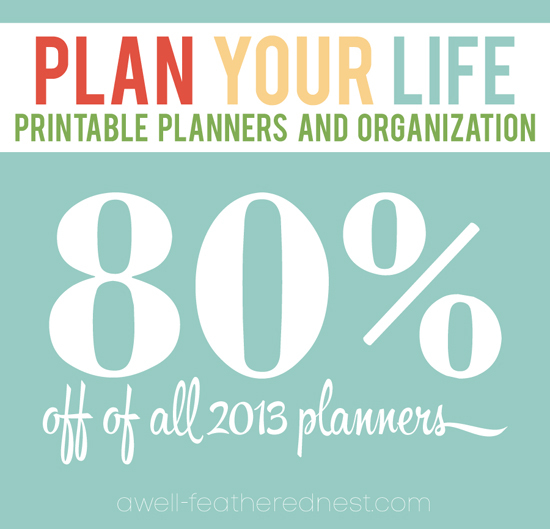 If you want to see how a printable planner might work for you, this is a great opportunity. The 2014 planners (with a few tweaks, updates, and new formats) is coming soon, so get this discounted 2013 planner while it lasts! I want to buy the 2013 set, but i also want the 2014 set before i get it bound. Any idea when those will be ready? or just blank calendar pages where i can fill in the dates myself? My goal is to have the 2014 editions up by the beginning of September!